The city of Marrakech (Red City), Morocco’s second largest city, lies by the the snow-capped Atlas Mountains. The Medina (old fortified city) is joined to modern Gueliz and has the largest traditional market (souk) in Morocco called Djemaa el Fna. 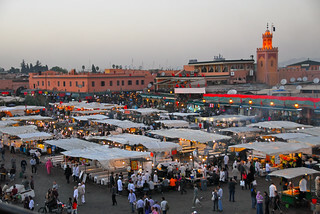 Marrakech is served by Ménara International Airport and has a rail link to Casablanca. The old town in particular is full of interesting artisans like musicians, dancers, acrobats and story-tellers. Marrakech is widely known for its “seven saints” (one being the city’s patron, Sidi Bel Abbas), established during the period of sufism by the sultan. There are several relics and monuments associated with them, dotted throughout the city. Notable city attractions include The Saadian Tombs, the Koutoubia Mosque, the Bab Agnaou city gate, the Agdal and Menara gardens and the Ben Youssef Madrasa courtyard. The Djemaa el Fna square makes for a fascinating visit, particularly by night. Other nightlife includes lively pubs, bars, cafes and traditional restaurants, particularly around the old city. 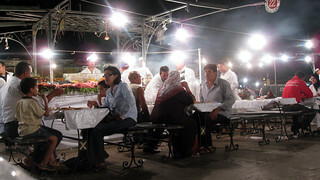 For food, try the main square’s stalls under large white canopies. 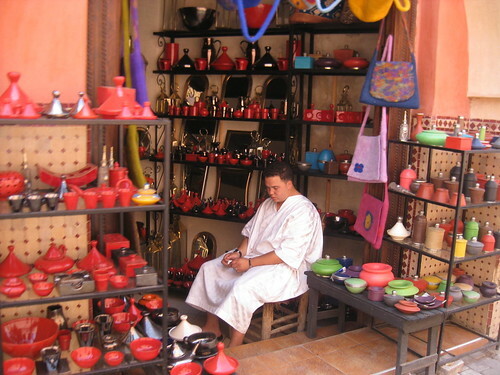 Tajine (stews with aromatic vegetables and sauces cooked slowly in earthenware pots), various types of couscous and spicy offal are tasty local specialities. Although alcohol consumption in public is frowned upon, you can enjoy an alcoholic drink with a meal in a restaurant. If you want to splash out, try the Fantasia of Chez Ali a few miles from Marrakech. Here you can dine stylishly in royal tents, while watching horse back riding with superb horsemanship and ethnic dancers performing in colourful clothes. Possible day trips from Marrakech include the Waterfalls of Beni Mellal, Essaouira on the Atlantic ocean, the valleys of the Draa River by the Sahara desert and the Ourika River in the Atlas Mountains. Casablanca can be visited by car via the (toll) motorway, by CTM coaches (intercity buses) and/or railway, which also connects to the cities of Tangier, Rabat and Fes.